For almost a century, astronomers have understood that the Universe is in a state of expansion. This is a consequence of General Relativity, and the rate at which it is expanding is known as the Hubble Constant – named after the man who first noticed the phenomena. However, astronomers have also learned that withing the large-scale structures of the Universe, galaxies and clusters have also been moving closer and relative to one other. For decades, astronomers have sought to track how these movements have taken place over the course of cosmic history. And thanks to the efforts of international team of astronomers, the most detailed map to date of the orbits of galaxies that lie within the Virgo Supercluster has been created. This map encompasses the past motions of almost 1,400 galaxies within 100 million light years of space, showing how our cosmic neighborhood has changed. The study which details their research recently appeared in The Astrophysical Journal under the title “Action Dynamics of the Local Supercluster“. Led by Edward J. Shaya of the University of Maryland, the team included members from the UH Institute of Astronomy, the Racah Institute of Physics in Jerusalem, and the Institute for Research of the Fundamental Laws of the Universe (IRFU) in Paris. Orbits of galaxies in the Local Supercluster. Credit: Brent Tully. For the sake of their study, the team used data from the CosmicFlows surveys, a series of three studies that calculated the distance and speed of neighboring galaxies between 2011 and 2016. Several members of the study team were involved in these surveys, which they then paired with other distance and gravity field estimates to construct a massive flow study of the Virgo Supercluster. What they found was that their models fit the present day velocity flow well, meaning that the structures and speeds they observed in their models fit with what has been observed from galaxies in the present day. They also determined that within the area of space they mapped, the main gravitational attractor is the Virgo Cluster – which is located about 50 million light years away and contains between 1300 and 2000 galaxies. 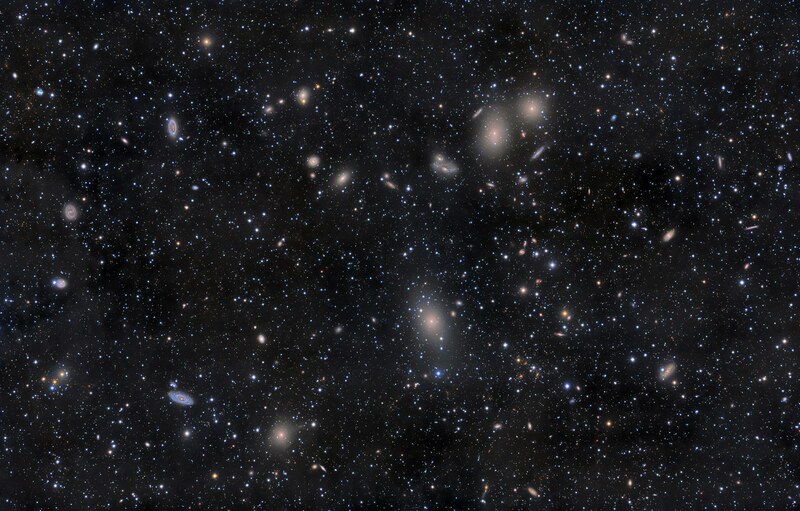 Moreover, their study indicated that more than a thousand galaxies have fallen into the Virgo Cluster in the past 13 billion years, while all galaxies within 40 million light-years of the cluster will eventually be captured. At present, the Milky Way lies just outside this capture zone, but both the Milky Way and the Andromeda Galaxy are destined to merge in the next 4 billion years. Once they do, the fate of the resulting massive galaxy will be similar to the rest of the galaxies in the area of study. This was another takeaway from the study, where the team determined that these merger events are merely part of a larger pattern. Basically, within the region of space they observed, there are two overarching flow patterns. Within one hemisphere of this region, all galaxies – including the Milky Way – are streaming towards a single flat sheet. At the same time, every galaxy over the entire volume of space is moving towards gravitational attractors that are located far beyond the area of study. They determined that these outside forces are none other than the Centaurus Supercluster – a cluster of hundreds of galaxies, located approximately 170 million light years away in the Centaurus constellation – and the Great Attractor. The Great Attractor is located 150 million light years away, and is a mysterious region that cannot be seen because of its location (on the opposite side of the Milky Way). However, for decades, scientists have known that our galaxy and other nearby galaxies are moving towards it. The region is also the core of the Laniakea Supercluster, a region that spans more than 500 million light-years and contains about 100,000 large galaxies. In short, while the Universe is in a state of expansion, the dynamics of galaxies and galaxy clusters indicate that they still gravitate into tighter structures. Within our cosmic neighborhood, the main attractor is clearly the Virgo Cluster, which is affecting all galaxies within a 40 million light-year radius. Beyond this, it is the Centaurus Supercluster and the Great Attractor (as part of the larger Laniakea Supercluster) that is tugging at our strings. By charting this process of attraction that has been taking place over the past 13 billion years, astronomers and cosmologists are able to see just how our Universe has evolved over the course of the majority of its history. With time, and improved instruments that are capable of looking even deeper into the cosmos (such as the James Webb Space Telescope) we are expected to be able to probe even further back towards the beginning of the cosmos. Charting how our Universe has changed over time not only confirms our cosmological models and verifies predominant theories about how matter behaves on the largest of scales (i.e. General Relativity). It also allows scientists to predict the future of our Universe with a fair degree of certainty, modelling how galaxies and superclusters will eventually come together to form even larger structures. The team also created a video showing the results of their study, as well as an interactive model that let’s users examine the frame of reference from multiple vantage points. Be sure to check out the video below, and head on over to the UH page to access their interactive model. Welcome back to Messier Monday! Today, we continue in our tribute to our dear friend, Tammy Plotner, by looking at the barred spiral galaxy, Messier 58. In the 18th century, while searching the night sky for comets, French astronomer Charles Messier kept noting the presence of fixed, diffuse objects in the night sky. In time, he would come to compile a list of approximately 100 of these objects, with the purpose of making sure that astronomers did not mistake them for comets. However, this list – known as the Messier Catalog – would go on to serve a more important function, becoming one of the first catalogs of Deep Sky Objects. One of these objects is the intermediate barred spiral galaxy known as Messier 58, which is located approximately 68 million light years away in the Virgo constellation. In addition to being one of just four barred spiral galaxies in the Messier Catalog, it is also one of the brightest galaxies in the Virgo Supercluster. Due to its proximity in the sky to other objects in the Virgo Galaxy Field, it can be seen only with the help of a telescope or a pair of large binoculars. “We have modelled the low-luminosity active galactic nuclei (AGN) NGC 4579 by explaining both the continuum and the line spectra observed with different apertures. It was found that the nuclear emission is dominated by an AGN such that the flux from the active centre (AC) is relatively low compared with that of the narrow emission-line region (NLR) of Seyfert galaxies. However, the contribution of a young starburst cannot be neglected, as well as that of shock-dominated clouds with velocities of 100, 300 and 500kms-1. A small contribution from an older starburst with an age of 4.5 Myr, probably located in the external nuclear region, is also found. HII regions appear in the extended regions, where radiation and shock-dominated clouds prevail. Galaxy NGC 4579 was captured by the Spitzer Infrared Nearby Galaxy Survey (SINGS) Legacy Project using the Spitzer Space Telescope’s Infrared Array Camera (IRAC). In this image, the red structures are areas where gas and dust are thought to be forming new stars, while the blue light comes from mature stars. This SINGS image is a four-channel, false-color composite, where blue indicates emission at 3.6 microns, green corresponds to 4.5 microns, and red to 5.8 and 8.0 microns. The contribution from starlight (measured at 3.6 microns) in this picture has been subtracted from the 5.8 and 8 micron images to enhance the visibility of the dust features. Messier 58 may not have been a comet, but it certainly was another distant cousin of our own Milky Way! Finding M58 requires a telescope or large binoculars, and lots of patience. Because the Virgo Galaxy field contains so many galaxies which can easily be misidentified, it is sometimes easier to “hop” from one galaxy to the next! In this case, we need to start by locating bright Vindemiatrix (Epsilon Virginis) almost due east of Denebola. Let’s hop four and a half degrees west and a shade north of Epsilon to locate one of the largest elliptical galaxies presently known – M60. At a little brighter than magnitude 9, this galaxy could be spotted with binoculars, but stick with your telescope. In the same low power field (depending on aperture size) you may also note faint NGC 4647 which only appears to be interacting with M60. Also in the field to the west (the direction of drift) is our next Messier, bright cored elliptical M59. Now we will need to continue about an average eyepiece field of view, or a degree further west of this group to bring you to our “galactic twin”, fainter M58. In a smaller telescope, do not expect to see much. What will appear at low power is a tiny egg-shaped patch of contrast change. As aperture increases, so does detail and a bright nucleus will begin to appear as you move into the 4-6″ size range and dark sky locations. As with all galaxies, dark skies are a must! We have written many interesting articles about Messier Objects here at Universe Today. Here’s Tammy Plotner’s Introduction to the Messier Objects, M1 – The Crab Nebula, and David Dickison’s articles on the 2013 and 2014 Messier Marathons. Be to sure to check out our complete Messier Catalog. And for more information, check out the SEDS Messier Database. Clearly I need to learn to be more specific when I write these articles. Everything time I open my mouth, I need to prepare for the collective imagination of the viewers. We did a whole article about the biggest things in the Universe, and identified superclusters of galaxies as the best candidate. Well, the part of superclusters actually gravitationally bound enough to eventually merge together in the future. But you had other ideas, including dark energy, or the Universe itself as the biggest thing. Even love? Aww. One intriguing suggestion, though, is the idea of the vast cosmic voids between galaxies. Hmm, is the absence of something a thing? Whoa, time to go to art school and talk about negative space. Ah well, who cares? It’s a super interesting topic, so let’s go ahead and talk about voids. When most people imagine the expansion of the Universe after the Big Bang, they probably envision an equally spaced smattering of galaxies zipping away from one another. And that’s pretty accurate at the smallest scales. But at the largest scales, like when you can see billions of light-years in a cube that fits on your computer screen, then a larger structure starts to take shape. It looks less like an explosion, and more like a tasty tasty sponge cake, with huge filaments, walls, and the vast gaps in between. The gaps, the voids, the supervoids, are the point of today’s article, but to understand the gaps, we’ve got to understand why the Universe is clumped up the way it is. Run the Universe clock backwards, all the way to the beginning, to a fraction of a second after the Big Bang. When the entire cosmos was compressed down into a tiny region of superheated plasma. Although it was mostly uniform in density, there were slight variations – quantum fluctuations in spacetime itself. And as the Universe expanded, those differences were magnified. What started out as tiny differences in the density of matter at the smallest scale, turned into regions of higher and lower density of matter in the Universe. Here we are, 13.8 billion years after the Big Bang, and we can see how the microscopic variations at the beginning of time were magnified to the largest scales. Instead of individual galaxies, we see huge walls containing thousands of galaxies; filaments of galaxies connect in nodes. These structures are huge; hundreds of millions of light-years across, containing thousands of galaxies. But the gaps, the voids, between these clusters can be even larger. Astronomers first started thinking about these voids back in the 1970s, when the first large-scale surveys of the Universe were made. By measuring the redshift of galaxies, and determining how fast they were speeding away from us, astronomers started to realize that the distribution of galaxies wasn’t even. Some galaxies were relatively close, but then there were huge gaps in distance, and then another cluster of galaxies collected together. Over the last few decades, astronomers have built sophisticated 3-dimensional models that map out the Universe in the largest scales. The Sloan Digital Sky Survey, updated in 2009, has provided the most accurate map so far. The Large Synoptic Survey Telescope, destined for first light in a few years will take this to the next level. The largest void that we currently know of is known as the Giant Void (original, I know), and it’s located about 1.5 billion light-year away. It has a diameter of 1 billion to 1.3 billion light-years across. To be fair, these regions aren’t really completely empty. They just have less density than the regions with galaxies. In general, they’ve got about a tenth the density of matter that’s average for the Universe. Which means that there’s still gas and dust in these regions, as well as dark matter. There will still be stars and galaxies out in the middle of those voids. Even the Giant Void has 17 separate galaxy clusters inside it. You might imagine continuing to scale outward. Maybe you’re wondering if the this spongy distribution of matter is actually just the next step to an even larger structure, and so on, and so on. But it isn’t. In fact, astronomers call this “the End of Greatness”, because it doesn’t seem like there’s any larger structure to the Universe. As the expansion of the Universe continues, these voids are going to get even larger. The walls and filaments connecting clusters of galaxies will stretch and break. The voids will merge with each other, and only gravitationally bound galaxy clusters will remain as islands, adrift in the expanding emptiness. The full scale of the observable Universe is truly mind boggling. We’re here in this tiny corner of the Local Group, which is part of the Virgo Supercluster, which is perched on the precipice of vast cosmic voids. So much to explore, so let’s get to work. What Is The Biggest Thing in The Universe? Think big. Really big. Like, cosmic big. How big can things in the Universe get? Is a galaxy big? What about a supercluster? What is the biggest thing in the Universe? Our observable Universe is a sphere 96 billion light-years across, and the entire Universe might be infinite in size. Which is a hoarders dream walk-in closet space stuffed full of “things”. It’s loaded down with so much stuff, we’ve even given up naming things individually and now just spew out a list of letters and numbers to try and keep track of it all. So, as is traditional, in a fit of adolescent OCD and one-upmanship reserved generally for things like tanks, planes and guns, we’re drawn to the question… What’s the biggest thing in the Universe. Well, 14 year old Fraser Cain, put down your copy of “Weapons and Warfare Volume 3” which you picked up at the dollar store as part of an incomplete set, as this is going to get a little tricky. It all depends on what you mean by a “thing”. The biggest physical object is probably a star. The largest possible red giant star could be as big as 2,100 times the size our Sun. Placed inside our own Solar System, a monster star like this would extend out past the orbit of Saturn. That’s big, but we might be able to get even bigger if we’re willing to get past the idea that a “thing” has to be a homogeneous physical object. Consider the regions around supermassive black holes. Within our own galaxy, things are pretty quiet, but around actively feeding black holes, there can be disks of material with such temperature and density that they act like the core of a star, fusing hydrogen into helium. Which, purely based on high volumetric density of pure awesome, I’m going to call a thing. An accretion disk around a quasar could be light days across, extending well past the orbit of Pluto and killing us all, if you dumped it in our Solar System. If we’re going to be all philosophical about what constitutes a “thing” and you’re not all fussy about physical structure and just want a collection of material held together by gravity, then we can really can make some leaps and bounds in our “who’s got the biggest” measuring contest. Our own galaxy extends up to 120,000 light-years across. There are much larger galaxies, ones that make the Milky Way look like that cat leash pendant from Men In Black 2. And ours is just one contained within a much larger cluster of galaxies known, rather unimaginatively, as the Local Group. Don’t let the centrist name fool you, this cluster contains around 50 galaxies and measures more than 10 million light-years across. And we’re just getting started. The Local Group is one part of the Virgo Supercluster. A massive galactic structure that measures 110 million light-years apart. In 2014, astronomers announced that the Virgo Supercluster is just one lobe of an even larger structure, beautifully known as Laniakea, or “Immeasurable heaven” in Hawaiian. The name originated from Nawa’a Napoleon, an associate professor of Hawaiian Language at Kapiolani Community College. It honors the Polynesian sailors using “heavenly knowledge” navigating the Pacific Ocean, reminding us that romance is still alive and well in space and astronomy. Laniakea is centered around the Great Attractor – a mysterious source of gravity drawing galaxies towards it. I almost forgot about our size contest. So who’s got the biggest space thing? According to buzzkill Ethan Siegel from the Starts With a Bang blog, you can’t actually have a structure that’s as big as Laniakea, and call it a thing. The fine-print reality is that the expansion of the Universe is being accelerated by dark energy. These galaxies are being pushed apart by dark energy faster than gravity can pull them together. So they’d never be able to form into a single object given enough time. In other words, the largest possible object is a collection of galaxies at the exact size where gravity is just strong enough to overcome the expansive force of dark energy. Beyond that, everything’s getting spread apart, and it’s for our purposes we’re actually going to draw a line and say it’s not quite right to call it a thing. Unless you’d suggest a giant expanse of nothing is a thing… but let’s save that for another episode. So what do you think? Do you feel like it’s right to call superclusters like Laniakea “a structure”? The Milky Way Galaxy is an immense and very interesting place. Not only does it measure some 120,000–180,000 light-years in diameter, it is home to planet Earth, the birthplace of humanity. Our Solar System resides roughly 27,000 light-years away from the Galactic Center, on the inner edge of one of the spiral-shaped concentrations of gas and dust particles called the Orion Arm. 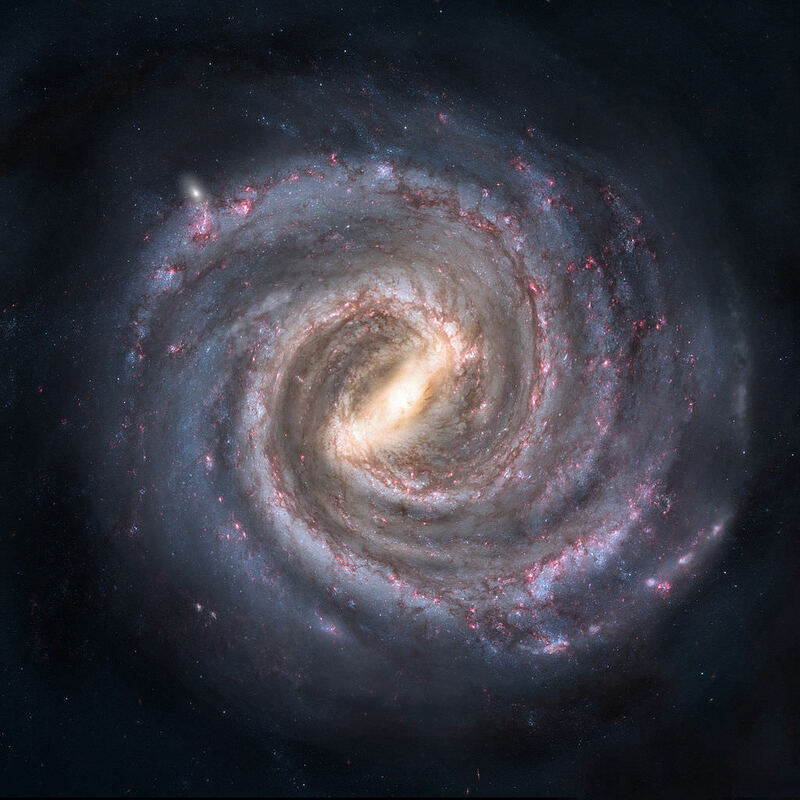 For starters, the Milky Way is a disk about 120,000 light years across with a central bulge that has a diameter of 12,000 light years (see the Guide to Space article for more information). The disk is far from perfectly flat though, as can be seen in the picture below. In fact, it is warped in shape, a fact which astronomers attribute to the our galaxy’s two neighbors -the Large and Small Magellanic clouds. These two dwarf galaxies — which are part of our “Local Group” of galaxies and may be orbiting the Milky Way — are believed to have been pulling on the dark matter in our galaxy like in a game of galactic tug-of-war. The tugging creates a sort of oscillating frequency that pulls on the galaxy’s hydrogen gas, of which the Milky Way has lots of (for more information, check out How the Milky Way got its Warp). 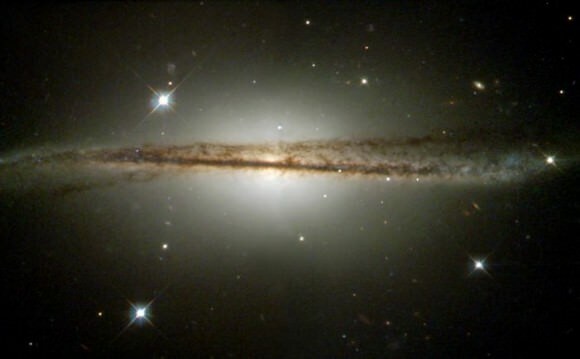 Scientists believe that 90% of our galaxy’s mass consists of dark matter, which gives it a mysterious halo. That means that all of the “luminous matter” – i.e. that which we can see with the naked eye or a telescopes – makes up less than 10% of the mass of the Milky Way. Its halo is not the conventional glowing sort we tend to think of when picturing angels or observing comets. In this case, the halo is actually invisible, but its existence has been demonstrated by running simulations of how the Milky Way would appear without this invisible mass, and how fast the stars inside our galaxy’s disk orbit the center. The heavier the galaxy, the faster they should be orbiting. If one were to assume that the galaxy is made up only of matter that we can see, then the rotation rate would be significantly less than what we observe. Hence, the rest of that mass must be made up of an elusive, invisible mass – aka. “dark matter” – or matter that only interacts gravitationally with “normal matter”. To see some images of the probable distribution and density of dark matter in our galaxy, check out The Via Lactea Project. As galaxies go, the Milky Way is a middleweight. The largest galaxy we know of, which is designated IC 1101, has over 100 trillion stars, and other large galaxies can have as many as a trillion. Dwarf galaxies such as the aforementioned Large Magellanic Cloud have about 10 billion stars. The Milky Way has between 100-400 billion stars; but when you look up into the night sky, the most you can see from any one point on the globe is about 2,500. This number is not fixed, however, because the Milky Way is constantly losing stars through supernovae, and producing new ones all the time (about seven per year). Though it may not look like it to the casual observer, the Milky Way is full of dust and gas. This matter makes up a whopping 10-15% of the luminous/visible matter in our galaxy, with the remainder being the stars. Our galaxy is roughly 100,000 light years across, and we can only see about 6,000 light years into the disk in the visible spectrum. Still, when light pollution is not significant, the dusty ring of the Milky Way can be discerned in the night sky. The thickness of the dust deflects visible light (as is explained here) but infrared light can pass through the dust, which makes infrared telescopes like the Spitzer Space Telescope extremely valuable tools in mapping and studying the galaxy. Spitzer can peer through the dust to give us extraordinarily clear views of what is going on at the heart of the galaxy and in star-forming regions. The Milky Way wasn’t always as it is today – a beautiful, warped spiral. It became its current size and shape by eating up other galaxies, and is still doing so today. In fact, the Canis Major Dwarf Galaxy is the closest galaxy to the Milky Way because its stars are currently being added to the Milky Way’s disk. And our galaxy has consumed others in its long history, such as the Sagittarius Dwarf Galaxy. Currently, we can’t take a picture of the Milky Way from above. This is due to the fact that we are inside the galactic disk, about 26,000 light years from the galactic center. It would be like trying to take a picture of your own house from the inside. This means that any of the beautiful pictures you’ve ever seen of a spiral galaxy that is supposedly the Milky Way is either a picture of another spiral galaxy, or the rendering of a talented artist. Imaging the Milky Way from above is a long, long way off. However, this doesn’t mean that we can’t take breathtaking images of the Milky Way from our vantage point! Most larger galaxies have a supermassive black hole (SMBH) at the center, and the Milky Way is no exception. The center of our galaxy is called Sagittarius A*, a massive source of radio waves that is believed to be a black hole that measures 22,5 million kilometers (14 million miles) across – about the size of Mercury’s orbit. But this is just the black hole itself. All of the mass trying to get into the black hole – called the accretion disk – forms a disk that has 4.6 million times the mass of our Sun and would fit inside the orbit of the Earth. Though like other black holes, Sgr A* tries to consume anything that happens to be nearby, star formation has been detected near this behemoth astronomical phenomenon. The most recent estimates place the age of the Universe at about 13.7 billion years. Our Milky Way has been around for about 13.6 billion of those years, give or take another 800 million. The oldest stars in our the Milky Way are found in globular clusters, and the age of our galaxy is determined by measuring the age of these stars, and then extrapolating the age of what preceded them. Though some of the constituents of the Milky Way have been around for a long time, the disk and bulge themselves didn’t form until about 10-12 billion years ago. And that bulge may have formed earlier than the rest of the galaxy. As big as it is, the Milky Way is part of an even larger galactic structures. Our closest neighbors include the Large and Small Magellanic Clouds, and the Andromeda Galaxy – the closest spiral galaxy to the Milky Way. Along with some 50 other galaxies, the Milky Way and its immediate surroundings make up a cluster known as the Local Group. And yet, this is still just a small fraction of our stellar neighborhood. Farther out, we find that the Milky Way is part of an even larger grouping of galaxies known as the Virgo Supercluster. Superclusters are groupings of galaxies on very large scales that measure in the hundreds of millions of light years in diameter. In between these superclusters are large stretches of open space where intrepid explorers or space probes would encounter very little in the way of galaxies or matter. In the case of the Virgo Supercluster, at least 100 galaxy groups and clusters are located within it massive 33 megaparsec (110 million light-year) diameter. And a 2014 study indicates that the Virgo Supercluster is only a lobe of a greater supercluster, Laniakea, which is centered on the Great Attractor. The Milky Way, along with everything else in the Universe, is moving through space. The Earth moves around the Sun, the Sun around the Milky Way, and the Milky Way as part of the Local Group, which is moving relative to the Cosmic Microwave Background (CMB) radiation – the radiation left over from the Big Bang. The CMB is a convenient reference point to use when determining the velocity of things in the universe. Relative to the CMB, the Local Group is calculated to be moving at a speed of about 600 km/s, which works out to about 2.2 million km/h. Such speeds stagger the mind and squash any notions of moving fast within our humble, terrestrial frame of reference! We have written many interesting articles about the Milky Way for Universe Today. Here’s 10 Interesting Facts about the Milky Way, How Big is the Milky Way?, What is the Closest Galaxy to the Milky Way?, and How Many Stars Are There in the Milky Way? For many more facts about the Milky Way, visit the Guide to Space, listen to the Astronomy Cast episode on the Milky Way, or visit the Students for the Exploration and Development of Space at seds.org. What is the Milky Way? When you look up at the night sky, assuming conditions are just right, you might just catch a glimpse of a faint, white band reaching across the heavens. This band, upon closer observation, looks speckled and dusty, filled with a million tiny points of light and halos of glowing matter. What you are seeing is the Milky Way, something that astronomers and stargazers alike have been staring up at since the beginning of time.